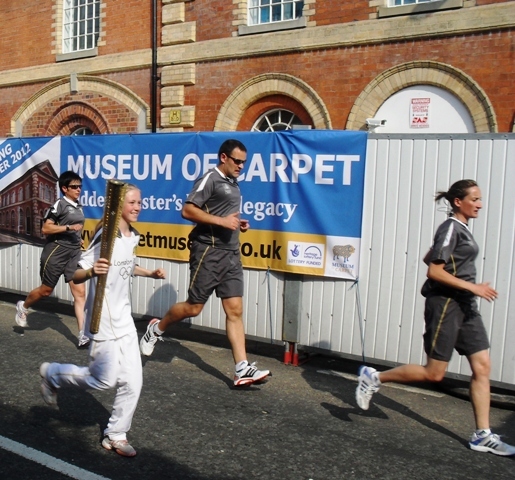 Just after 4.35pm on 24 May 2012, the Olympic torch was carried past the Museum of Carpet as part of the nation-wide relay leading up to the London Olympics. Earlier in the day, the flame had arrived in Cleobury Mortimer from Clee Hill. It was carried through the town then taken onward to Far Forest, Callow Hill and Bewdley. After a celebratory run through the old market town of Bewdley to the Severn Valley Railway station, the relay team climbed up onto the footplate of the Worcestershire Express. The steam locomotive then stopped beside the elephant enclosure at the West Midlands Safari Park, where the torchbearers were saluted by two enthusiastic elephants. On arriving at the railway station in Kidderminster, the torch was carried down into the town centre, along Green Street to Chester Road South, where the relay team boarded the coach to make their way to Droitwich Spa. Next Are you ready for some ADVENT-ures?